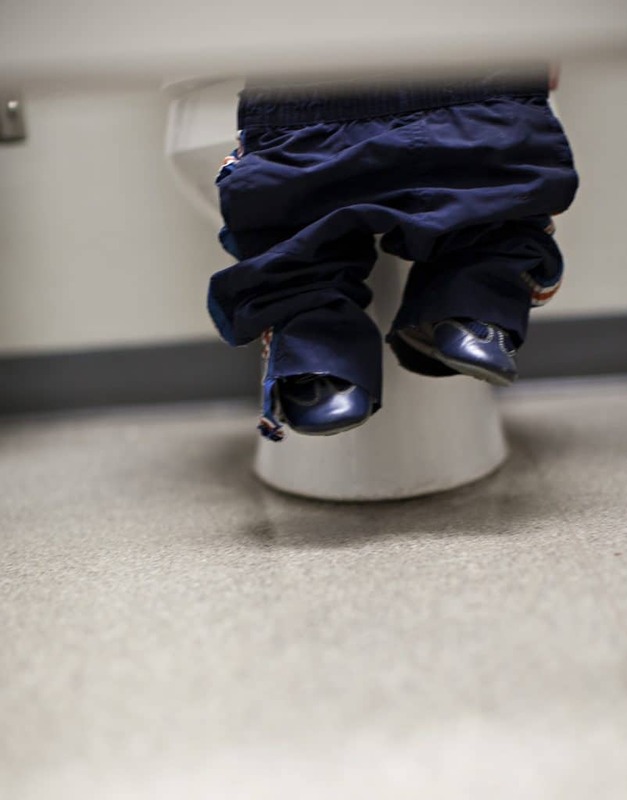 When it is time to start potty training, many a parents are filled with dread. We have all heard the stories, from the child that practically potty trains themselves, to the child that is an absolute nightmare. But when it comes to your child, how will you know if they are ready? How do you begin? What will you need? Read on for everything that you need to know. 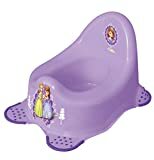 Have a potty in the house as soon as you consider potty training and long before you actually begin. You can talk about it and what it is for. Toys and teddies can have a turn at sitting on it. 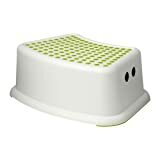 The more familiar that your child is with the potty, the easier they will find it all. When you go to the toilet, take your little one with you (chances are, as a Mum, it’s rare that you have a wee in peace anyway). Talk about what you are doing. “Oh look, Mummy is pulling down her pants, Mummy is sitting on the toilet, Mummy is doing a wee” etc. This will help to familiarise your little one with the whole process. Sit your child on their potty while you have a wee. It doesn’t even matter that they will still have their nappy on, just the fact that they are content sitting on the potty at all is a good start. 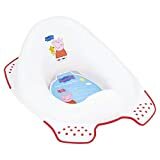 Sitting your little one on the potty when they first wake up will mean they will have quite a good chance of managing to wee on it. Once they have done a wee on the potty and received huge praise from you, they will start to get the hang of what you expect from them. It is also worth sitting them on the potty before bath time when they are undressed anyway. There will be a lot of emphasis on how grown up they will be when they can wee and poo on the potty. It is important to treat them like they are growing up by involving them in decisions to do with their toilet training. The more involved they are in the process, the more that they will buy into it. They could chooses which potty they want and where they think it should go. 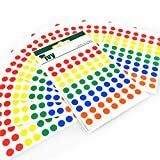 When you download the reward chart from the bottom of this post, you will see that the chart is available in 5 different colours so that your child can choose their favourite. 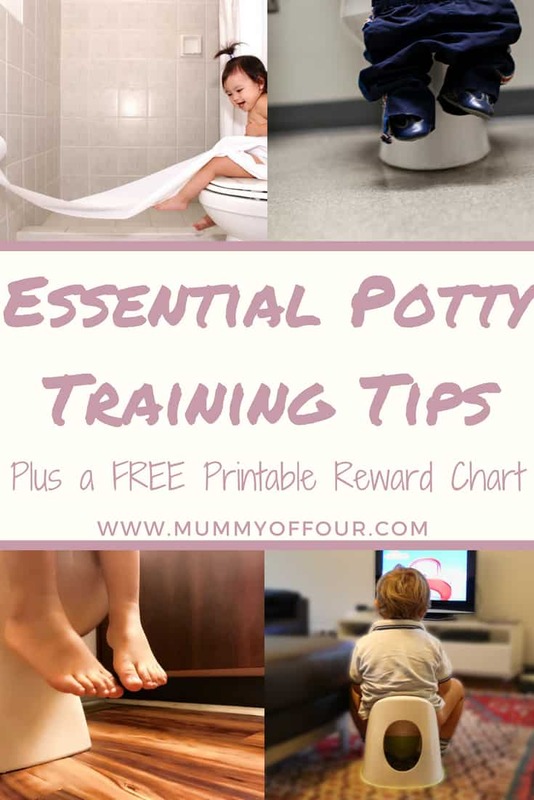 When it comes to selecting a reward to work towards during potty training, allowing your little one to help select their own reward will mean that they will be far more invested and motivated to succeed. Before you begin, make sure that you have everything that you need to give you the beat chance of succeeding. 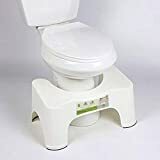 I would recommend purchasing at least 2 potties, one for upstairs and one for downstairs. You will not be given much warning at the beginning and will need the potty as close as possible to where you are. Some parents choose to go straight to the toilet seat. While this is an option, I personally liked to have the potty so that we were not tied to the bathroom. A toilet seat is a great idea to have as well as a potty and for the next stage too. Chances are, if there is going to be wee on the floor, there will be wee near the potty. Whether it is a case of not quite making it in time, or an over enthusiastic toddler kicking over their potty full of urine. I found that placing towels on the floor underneath the potty will catch the worst of most accidents. A step will make reaching the sink for hand washing a bit easier, plus will help your child get on and off the toilet independently when they are ready. Knickers or pants. Make sure you get lots of pairs to allow for accidents in the beginning. I love the JoJo Maman Bebe training pants and training knickers. They feel like “real” pants but have just the smallest absorbent patch, which will catch the worst of any accident, while allowing your little feel wet enough to understand what has happened. 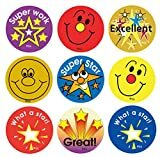 A reward chart will really help to incentivise your child to stay on track and work towards the goal of their chosen reward. Grab your FREE potty training chart here. The best news? I have created the chart in 5 different colours so that your little one can choose the one they like best. 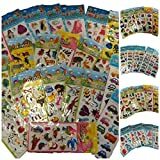 Get some stickers for your little one’s chart, or better yet, let them pick their own stickers. Honestly, the move choices you involve them with and the more ownership they have, the more likely that they will toilet train quickly. 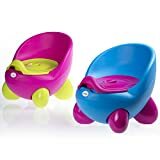 Gather a small selection of toys, books and games that they can play with on and around the potty. The longer that they are content to sit on the potty, the more likely they are to get the hang of it quickly. It may be helpful to line up some episodes of their favourite television show to watch. Before you begin properly, explain to your little one what what will be happening. Tell then that they are getting very grown up and won’t need those baby nappies any more. 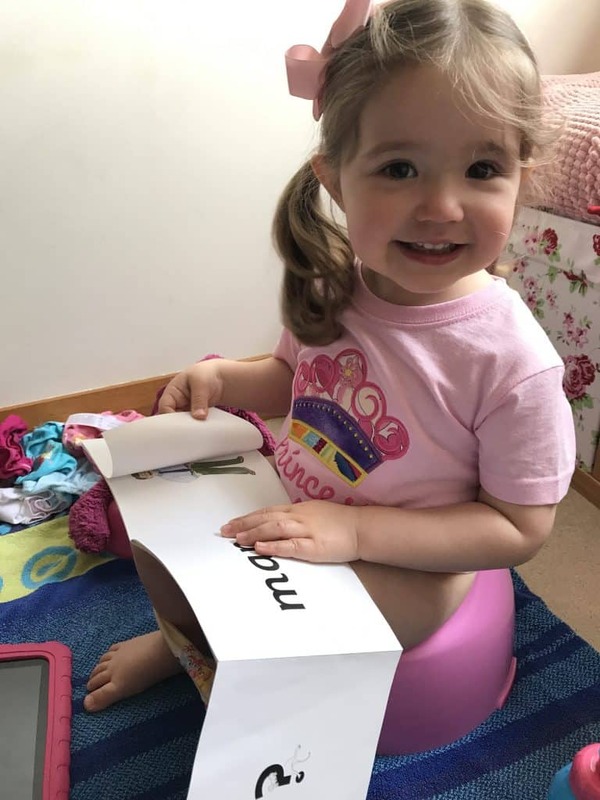 Explain that every time that they wee on the potty, they will get a sticker on their special chart (don’t forget to download the chart from the bottom of this page and let your child choose which colour chart they would like). Tell them that once they have filled the chart, they will have earned the reward that they chose and you agreed upon together. Then it is time to say goodbye to nappies! (Well, in the day at least.) Pick a time where you can stay in the house for a few consecutive days so that you do not have to deal with the distraction of being out and about initially. 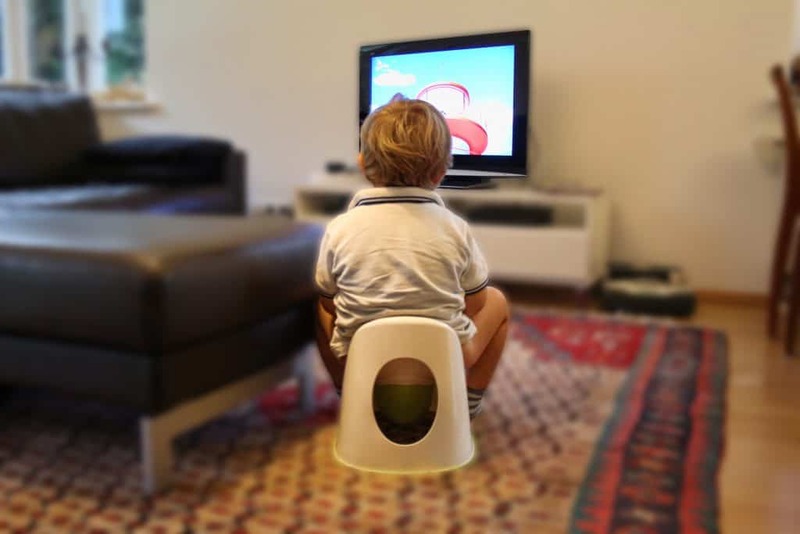 Sit your child on the potty for 5-10 minutes, ideally every 15-30 minutes for the first day. Every time they wee in the potty, make a huge fuss, congratulate them, and allow them to put their own sticker on the chart. It is very important to give them ownership of their reward. If (or more like when) they have an accident, don’t get cross. Say “Never mind, next time we’ll do wees on the potty”. Clean them up and sit them on the potty. 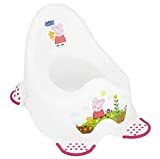 Keep sitting them on the potty at regular intervals, as it is unlikely that, in the beginning at least, they will give you any warning that they need to go. On a separate piece of paper, keep your own note of how many times that your little one sat on the potty, how many successful wees and poos they did and how many accident they had. 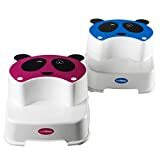 This way you will be able to see if they are progressing over the first few days and establish whether it is worth continuing now, or waiting until they are a little older. If your child becomes really upset or digs in their heels, do not force it. Even if you are getting those oh so helpful “Shouldn’t they be out of nappies by now” comments from friends or relatives, does not mean that they are ready. No matter how emotionally mature a child may be, children develop bowel and bladder control at different rates. If they are not ready, stop then go back to it when they are more ready for the process. Battling with a child that is not ready will not get you anywhere. Keep reading for some awesome tips from real Mums. My eldest was dry in the day just before his third birthday. I had tried about six months before but he just wasn’t ready, so I stopped. At just before 3, he took to it brilliantly and it really wasn’t a painful process. My youngest is 16 months and he’s already showing small signs. I mean he’s not ready in the slightest, but he already knows when he is going for a number two and often stands by the toilet just before he does one. That said, I did a tester and sat him on it and he screamed! Like I said…definitely not ready. My oldest (boy) was nearly 3. My daughter is autistic and decided on her 5th birthday to stop wearing nappies – and that was that! We thought she had no clue about anything, then all of a sudden, she did! My son was 2 and was dry within 2 days he was very good. I bought his favourite pants and he didn’t want to wet them. Went straight to the toilet with a seat rather than potty though. My best tip is to not feel any pressure to start or hurry the process – there will always be the parents who brag about how their children were dry by 3 weeks old, but seriously, your child will know when he or she is ready and so will you. Let’s face it – he / she won’t still be in nappies aged 10 … it will happen, so relax. My eldest was 2 and 4 months when he kept saying when he was weeing and pooing. So I thought let’s give it a go and within 3 days he was dry, now I know this is early, but he was just ready. He still uses a mix of potty and toilet and now just takes himself when he needs to go! However, he still wears nappy pants to bed (he’s just turned 3). My youngest will be 2 in April and she has just started to say when she has pooed and ask for her bum to be cleaned!!! I’ve just bought some little pants for her so I’m ready and armed as I don’t think she will be long- I just need a long weekend off work to get started- maybe next bank holiday! Edith was dry from 26 months and she’s been dry in the night since her 3rd birthday. She’s been pretty easy I’ve been very lucky. Crèche definitely helped me too as they would be helping me train her when she was there 3 days a week. I just left a potty in the living room and she just started using it. I think the dry nights just follow naturally in time. My advice is to wait until your child is ready. Two years seems to be everybody’s magic number to start yet they are usually still too young to understand the concept. Don’t force it. Introduce the potty or toilet and then let them take the lead. For us this was 2 years 9 months. He went straight to the toilet and has only ever had about two accidents. My eldest was dry in the day at 23 months – very easy! Dry in the night by his 3rd birthday. My youngest was dry in the day and night at 27 months. I waited until she was ready. She’s only wet the bed twice! I never had any problems, just kept a potty in the living room for the first couple months and did lots of happy dances when they used it. Wait until they are ready, Lucas was dry overnight for a couple of months before he potty trained during the day. Once you start in the day, Carey a travel potty with you everywhere. I have Lucas the choice of a bee, ladybird and cow potty so he could have control over it. Don’t be afraid to ‘give up’. If in your gut you feel it’s not working, your instinct is probably right. I wrote a post about my experience of regression and how our little boy ended up deciding when he wanted to do it. Little Man had just turned 3 when he finally cracked it. Try getting your child to blow bubbles when they are struggling to poo. It’s the same principle as in labour, relaxed mouths equals relaxed down below, which is exactly what you need for a number 2. Disclosure – this post contains affiliate links. For more information about what that means, please see the disclosure policy. YES to don’t force it! 100% Don’t force it. It can have dire results! Sadly and to my eternal guilt I listened to someone shooting their mouth off on social media about lazy working mums being why kids aren’t potty trained by two and a half (yes! as if that is way too late!). I went in too early and too stubornly and my child witheld her poo – ended up with quite serious, painful constipation which meant she had to have medication and support from ERIC (a wonderful charity for child continence) over several long months and many accidents and tears. 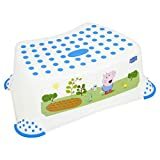 I never realised potty training too early could cause problems but you MUST MUST MUST look for the signs before you start and ignore the comments.